Earlier today Highways England promised to “sort out a solution to the issue, not just a response,” amid claims from Peterborough City Council leader John Holdich that “the consultation process has been shambolic. It has been nonexistent,” and word from Shailseh Vara MP that he would be complaining to Chief Executive of Highways England, Jim O’Sullivan. However a statement sent to the Peterborough Telegraph this evening offered no solution as promised and in fact added very little. 1) Where was the 24/7 closure advertised, and for how long? 2) Why was the local press not informed about the 24/7 closure? 3) Does the Highways England feel the closures were advertised well enough? 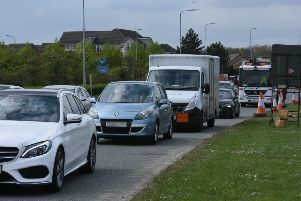 4) Was the level of congestion across Peterborough throughout the day anticipated? 5) If so, what communication was there with bus company Stagecoach, who said every bus route in the city was delayed? 6) What consultation was done with Peterborough City Council with regards the roadworks which have been taking place for months on the A15? 7) What hours are road workers working to get the work done as soon as possible? We had reports of no work taking place at 4pm today. 8) Is it anticipated that the level of congestion in the city today will continue throughout the works? The statement from Highways England did say: “We are aware of the congestion caused by the essential work we are carrying out on the A1(M) southbound at junction 17 and would like to apologise for the disruption. “We have been working hard to put more detailed information about the restrictions on our website. We have also installed some additional electronic message signs and directional signs in the area to make extra sure that drivers are informed and aware of the diversion in place. We are also working in close collaboration with Cambridgeshire County Council and Peterborough Council to ensure our diversion on their network runs as freely as possible. “The work, which includes the reconstruction of the carriageway, renewal of the road markings, improvements of the drainage system and installation of traffic sensors to help monitor traffic flows more accurately, started on Friday 16 June and is going to plan. It is planned for completion in August.